Copyright Control ©+℗ 2015 – Photography & design: Ph. F.
From the adventerous and bold mind of Philippe Fichot, mastermind and uncompromising head of the cult fetish Industrial/Electro outfit Die Form, comes a riveting new undertaking. 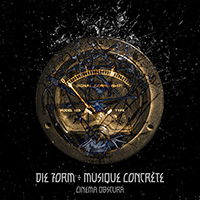 DIE FORM ÷ MUSIQUE CONCRÈTE is the new experimental, instrumental, cinematic, ambient solo-project of this French avantgarde Industrial pioneer, containing songs composed from 2013 to 2014. The tracks have been started during a recovery stay and were completed, improved and mixed in studio in 2015. Moreover, this project will be released on the original Die Form label Bain Total, reactivated in 2015! Since ages, music and sounds have always been a powerful medium to express various fundamental emotions without words. They are graced with the power to reveal and generate images from the invisible and the subconscious, they can lead composer and listener alike from borderline worlds to new visionary landscapes and mindscapes. Words are very unneccessary, as a certain band would have said. For this extraordinary project of Die Form mastermind Fichot, many different sources have been elaborately used and put to action: analogue and digital electronic tools in harmonic unison as well as noises and various tapes stemming from obscure sources – hence the “musique concrète” reference – as well as some natural and artificial voices to further build on the thin red line between the organic world and the realm of technology. This bold and courageous enterprise could be regarded as a transition between the past and the future, between man and machine, perpetually inspired by silence and meditation. When words fail, it is the music that prevails. Graced with a stunning artwork placed on the borderlands between dream and nightmare, set in a labyrinthine world of flesh and cables, that exquisitely echoes the musical mood of these unique tracks, „Cinema Obscura“ is a speechless dictionary of human emotions. Of wrath, of anger, of loss, of failure, of despair. But also of hope, lingering in unexpected places. Of memories, of love. Sometimes, we don’t need words to express what we feel. We just need to play records like this. I am very much looking forward to the release of the album on the 20 of November. I listened to the twenty second sneak peeks on SoundCloud and though they do sound at times strange and peculiar, they still have that old Die Form element of infused horror and beauty, which is done in absolute magnificent way.